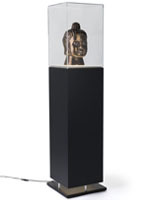 This pedestal display case is ideal for use as jewelry showcases or store fixtures within a museum or store. 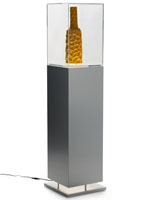 The collectibles stand, pedestal display case has a pedestal-like design to best highlight your displayed products. 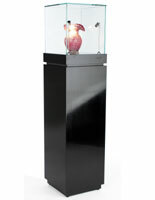 This pedestal display case, also known as jewelry showcases or store fixtures, feature a beautiful maple laminate, and features a clear acrylic top. 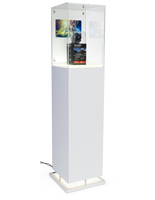 We provide the pedestal display case with two screws to secure the acrylic case onto the stand. 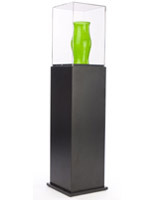 This acrylic pedestal display case has a maple laminate finish to blend in with any other store fixtures and to better showcase your displayed collectibles. 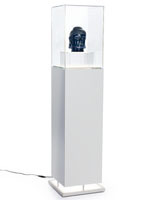 The stand itself is 35-1/2" tall, raising your displayed collectibles, or products, to a customer's eye-level. The pedestal display case can be used to highlight on-sale items, special collectibles or even jewelry, trophies and sports memorabilia. 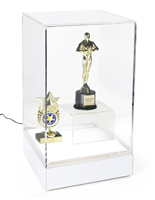 This store fixtures display, pedestal display case has a 17"h acrylic top, providing you with plenty of space to showcase taller items, such as trophies, dolls or sculptures. 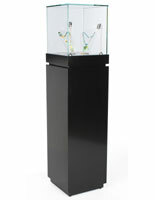 The pedestal display case, like store fixtures, is a great way to highlight special products, awards or collectibles! 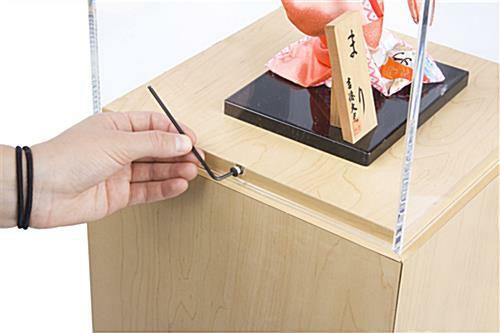 Jewelry showcases made from acrylic and maple laminate will save you money yet still provide you with striking display stands for your home, office, store, gallery or museum! We purchased this display to include with the new exhibit of Code Talker memorabilia at Homolovi State Park in Winslow, AZ. As you can see from the attached images, we are displaying a replica of the Congressional Medal of Honor given in 2013 to honor them for their service. This display provides a safe, modern home to honor our heroes at a great value. Hi Ken, What a wonderful tribute to the Hopi Tribe Code Talkers. Thank you for taking the time to share these photos, they are really touching.